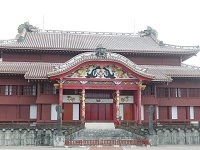 Shuri Castle of Okinawa, built in the 1300s, was the administrative center and residence of the Ryukyu kings until 1879 when Okinawa became a Japanese prefecture. 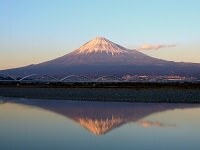 "Shuri" comes from the name of the former capital of Ryukyu Kingdom. During its use, the castle played a crucial role in politically unifying the island and as the center of foreign trade. Shuri Castle was burned down multiple times but was always reconstructed. The current castle buildings were last reconstructed in 1992. The castles interiors can be entered by visitors and they will find that the interiors of Hokuden (North Hall) and Nanden (South Hall) are deigned like modern museums. The castles's main hall, Seiden, however upholds its original style. Visitors can get a great view of Naha from the castle. 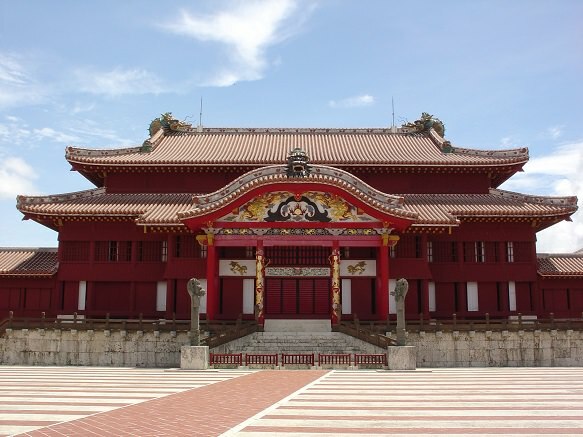 Shuri Castle is a UNESCO World Heritage site. 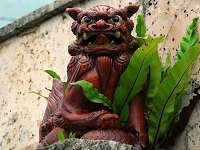 Okinawa's mythical Lion-Dogs protect homes and keep bad luck away.